Continuing our adventures in Macau, @eatnik and I thought it might be prudent to go for a walk in between breakfasts. Because after the cheong fun we were cruising for crab congee. So we wandered across Senado Square, and down a side street, where we stumbled upon Ying Dei market (opposite St Dominic’s Church). We wandered through three storeys of market stalls, sort of like a multi-leveled department store version of your average market. The first two floors were butchers of all sorts, including those selling live poultry and fish. This fellow was searing the hairs off a pig’s trotter, with the most impressive kitchen/butcher blowtorch we’d ever seen! He very obligingly posed for a shot when he saw our pyromaniac delight. We wandered through another two floors of fruit and vegetables, and fresh tofu, which brought back memories of the markets in Sai Gon. There’s a slightly off-putting smell about a tofu stand, but the fresh stuff tastes so good, it’s worth it. 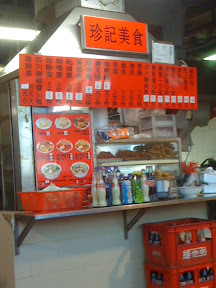 Finally, we reached the top floor, which was a cooked food centre – pretty much like a food court or hawker centre. There was a large range of food on offer – soup noodles, fried noodles, congee and various types of dim sum. But on our way in, I had spied an old lady, who looked like she worked in the market, biting into what looked like a pretty scrumptious zhu pa bao; that’d be Mandarin for PORK CHOP BUN. 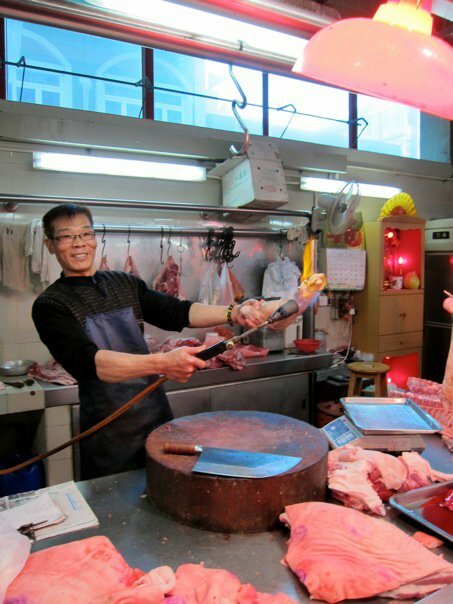 Macau’s Pork chop buns are regionally famous. To be honest, I hadn’t heard of them before I went to Macau a couple of years ago, and at that point I didn’t get around to trying one. It sounded a bit pedestrian and McDonald’s-esque. 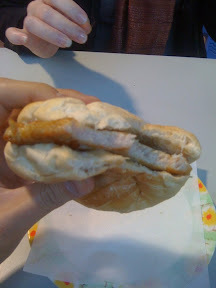 Basically, it’s a deep-fried or pan-fried pork chop, in a bun. From what I understand, it should be no more, no less. Although it’s common to have the option – as with most things in Asia – of adding a fried egg to that. Anyway, the little old lady was happily munching on her zhu pa bao and chatting with the owner of the stall from which she bought it. Another little old lady, though she wasn’t nearly as ancient as her customer. 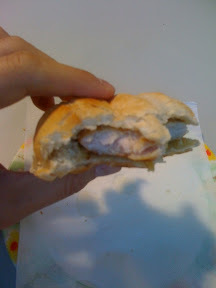 The fact that the older, munchier lady didn’t have all her teeth bode well, I thought, for the tenderness of the pork. So I ordered one, sans egg, and we sat down to see if I’d made a mistake. The zhu pa bao arrived on a little homely plastic plate, resting on a serviette. 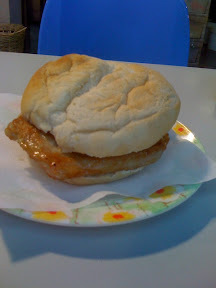 The bun was soft and dusty, and like most bread in Asia, a bit sweet. The inside had been toasted and lightly buttered, and the pork chop itself was covered with just enough oil to make it glisten. This pork chop had been pan-fried, in case you were wondering. The pictures really don’t do it justice, but every bite of this puffy morsel was pure joy. 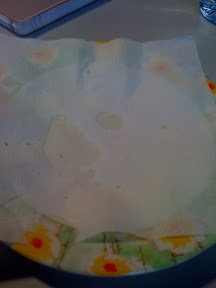 Cushioned by the fluffy, sweet bread, the pork chop would yield at the moment my teeth made contact with it, resisting only slightly, before succumbing to my toothy embrace, and giving up a moisture which neither @eatnik nor I could really ascertain one way or the other as meat juice or fat. But at that point, we were both beyond caring. The pork chop was well seasoned, but not overly salty. The overall flavour impression I got was of pure pork. Not in that heavy, dry roast pork way, but in a sweet, tender, juicy, only-just-cooked way. I’m salivating just remembering the joy of that pork chop. Sometimes it’s the little detours which you take, unexpectedly and on a whim, that lead to the greatest experiences when you’re on holiday. While we hadn’t planned our Hong Kong/Macau trip down with military precision, we had a pretty jam-packed google map of places we were aiming to hit. This tiny little stand in a local wet market wasn’t one of them. It also isn’t one of the places in Macau famous for zhu pa bao, but I’m oh-so-glad we found it! What a great discovery. I've not heard of this bun, but it sounds very yummo! So cool! Don't you love just stumbling on things. hmm… i think a trip out to macau is in order…!